GPM is proud to announce our new mechanical seal disassembly and inspection service. For the past 35 years GPM has taken great pride in providing you the best service and support for your pump and seal needs. GPM will now be able to help service your toughest sealing requirements with the help of our mechanical seal disassembly and inspection service of any brand mechanical seal. Upon shipment to GPM’s MSP shop the inspection process will begin. Your mechanical seal will be photographed completely throughout the entire inspection process. Special attention will be spent on seal faces, gasket, and hardware. 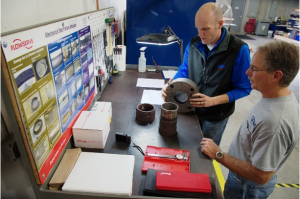 All seal inspection reports will include photographs, observations, and recommendations for longer mean time between failures. GPM has been a long time distributor for the Flowserve line of mechanical seals which include heritage brands like Durametallic, Five Star, Borg Warner, Pacific-Weitz and Pac-Seal. No matter what your sealing need is, GPM can help support you with the latest Flowserve seal technology, service, and on-site support, we also carry inventory of Flowserve Seals.